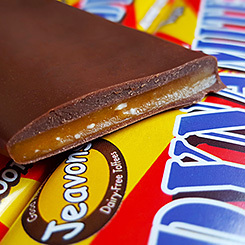 This bar is a thin, crunchy, crisp Almond toffee covered in our dairy-free ‘milk’ chocolate. It starts with a good crunch, then slowly melts to an almond-buttery chew. Totally vegan, and utterly gorgeous! Handmade in very small batches, like all of our products. 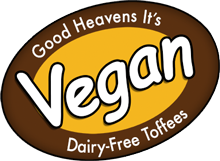 Unrefined Sugar, Glucose Syrup, Margarine (Sunflower Oil & Vegetable Oils), Soya Milk, Golden Syrup, Roasted Almonds, Lecithin (Soya), Salt, Vanilla Extract. Chocolate contains 42% cocoa solids, sugar, cocoa butter, soya flour, sunflower lecithin.